The 1884 Stamp Committee did not initially intend to alter the 1884 ½d slate-blue value, but proceed to after Warren De La Rue had submitted his final designs for the 1 1/2d to 1s values on 5th January 1885. Handpainted esssays were submitted to the Stamp Committee by De La Rue. At the 16th March 1885 meeting, Warren De La Rue recommended “orange” for the ½d, and the following day it was agreed that it should be “orange-red”. 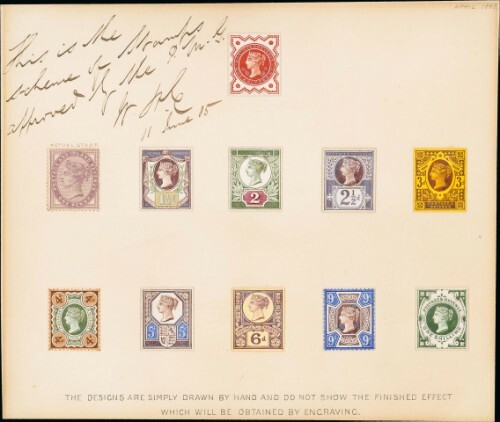 Warren De La Rue was then asked to produce yet more ½d designs with “Postage and Revenue”. At the final recorded meeting on 13th April 1885, a ½d design with the “½d” in each corner was accepted, provided the corner ½ds were removed. It is not known when the final selections were sent to the Post Master General, be he accepted all the designs (except for the 2 ½d). A piece with hand painted essays on white paper of all the approved designs, was signed and dated on the 11th June 1885 by W. C. Cousins.